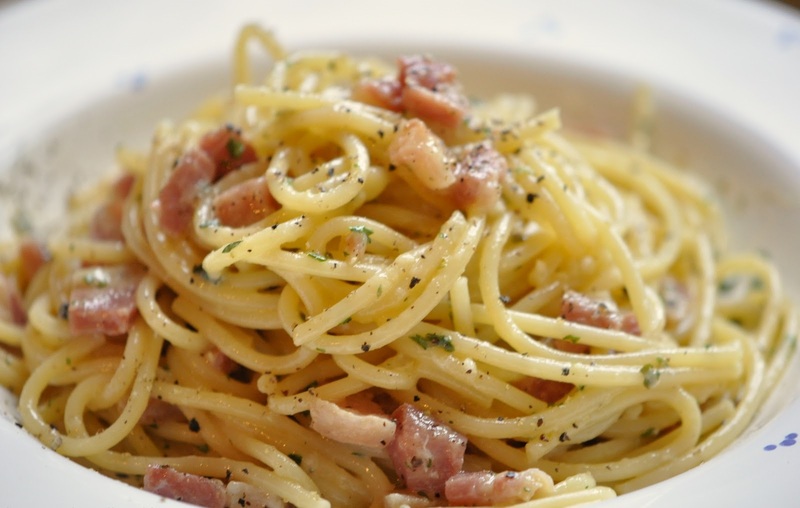 Spaghetti Alla Carbonara: Spaghetti alla carbonara (literally: charcoal burners’ spaghetti in Italian) is an Italian pasta dish based on eggs, pecorino romano, guanciale and black pepper. It was created in the middle of the 20th century. 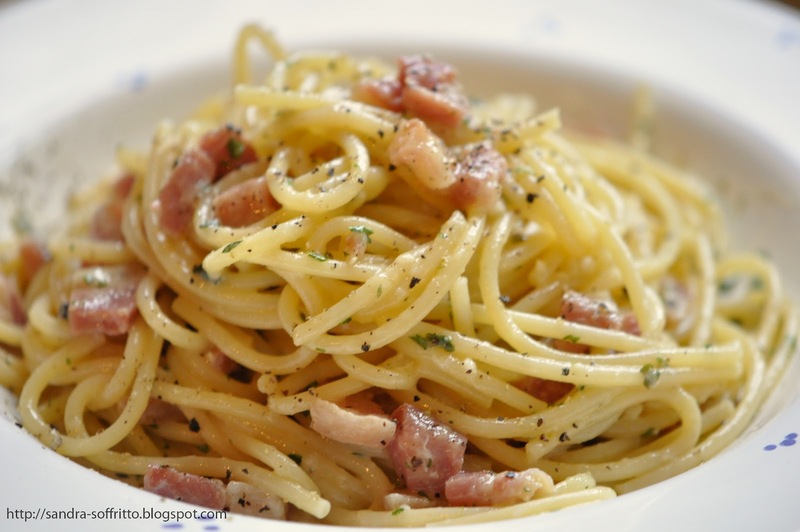 Ideally Spaghetti alla Carbonara is served with a red wine (Merlot, Chianti, Monte pulciano d’Abruzzo), allowed to decant for several hours, and served at 65°F (18°C). Cut the pancetta into approximately 1cmX 1cm cubes. Add 2tsp olive oil to it. Add the pancetta cubes in the oil until crispy but not crunchy. Let the white wine bubble away so that, after a few minutes, you have a small amount of salty winey syrup left. In a bowl, beat together the eggs, Parmesan, cream and some pepper. Cook the pasta al dente according to the packet instructions. Lower in a cup and remove approximately half cup of the pasta water before draining. Put the pan with the bacon cubes, on the heat. Add the drained pasta, tossing well to coat with the syrupy pancetta. Add a little of the reserved pasta water to emulsify, if necessary. Take the pan off the heat again. Add the eggs and cheese mixture, swiftly tossing everything to mix. Add some more black pepper powder and grated nutmeg. Spaghetti alla Carbonara is ready to be served. Serve hot Spaghetti alla Carbonara with a glass of red wine.